Depressive symptoms are frequently observed among individuals with vision loss. Exposing university students with blindness to a variety of rational emotive skills that would enable them to manage depression and depressive symptoms could be an important avenue to make them feel less depressed and become more energetic to successfully cope with their academic life. The objective of this study was to examine the efficacy of group-based rational emotive behavior therapy (REBT) intervention on depressive symptoms among selected university students with blindness in Nigeria. To assess the efficacy, a group randomized controlled trial design was employed. Participants (N = 65) recruited from universities in Southeast zone of Nigeria were randomly assigned to treatment (n = 33) and no-intervention control groups (n = 32) after meeting the study inclusionary criteria. REBT Depression Manual was used for the delivery of the intervention while depression was evaluated using Beck Depression Inventory-II. Students in the treatment group took part in the group-based REBT program for a period of 12 weeks and thereafter, a 2-week follow-up meeting, twice per week was done after 2 months of the intervention. All sessions lasted for about 60 min each. Data obtained were analyzed using a 2 × 3 within × between-subjects ANOVA with repeated measures, independent samples t test and paired samples t-test. The study revealed that in comparison to the no-intervention control group, the REBT group had significant reduction in their depression scores both at post-treatment and follow-up evaluations, but no such changes were seen in the control group. 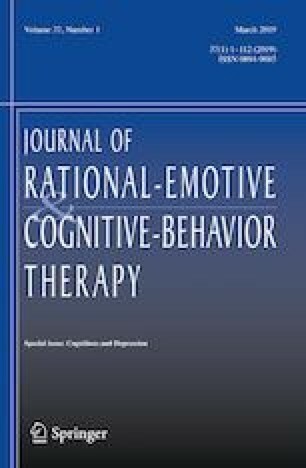 Given that an REBT program led to the significant reduction in depression among students with blindness, the implication is that depressive thinking, beliefs, and feelings can be surmounted in this special need population through the application of REBT evidence-based techniques. The Departmental Research Ethics Committee, Department of Educational Foundations at the University of Nigeria, Nsukka, Nigeria, provided the ethical approval for the conduct of the current study (REC/EDF/17/00005). We also complied with the ethical standards laid down by the American Psychological Association for conducting research with human subjects (American Psychological Association 2017). This study was also conducted in consonance with the Declaration of Helsinki (World Medical Association 2013). We obtained informed written consents from the Students Affairs Department of the Universities and from the study participants. The study was registered retrospectively in Pan African Clinical Trial Registry (Trial No. : PACTR201803003177455). American Addiction Centre. (2018). What is rational emotive behavior therapy? (REBT). Retrieved from https://riveroakstreatment.com/therapies-rehab/rational-emotive-behavior-therapy/. Accessed April 14, 2018. Centre for Rational–Emotive Behaviour Therapy at the University of Birmingham. (2018). What are irrational beliefs? Retrieved from https://www.birmingham.ac.uk/schools/psychology/centres/rebt/about/beliefs.aspx. Accessed April 14, 2018. Knaus, B. (2006). Depression can be defeated. Retrieved from http://www.rebtnetwork.org/essays/depression2.html. Accessed September 20, 2017. Mneimne, M. (2014). Demandingness or “The rules of life: Perceived abilities and $0.02. Retrieved from http://albertellis.org/demandingness-or-the-rules-of-life-perceived-abilities-and-2-cents/. Accessed April 11, 2018. World Medical Association. (2013). WMA declaration of Helsinki—Ethical principles for medical research involving human subjects. Retrieved July 15, 2016 from https://www.wma.net/policies-post/wma-declaration-of-helsinki-ethical-principles-for-medical-research-involving-human-subjects/.